If you’re a Toad for Oracle user I’m sure that you’ve seen the Jump to… box in the toolbars but have you ever used it? Unknown to many, it’s one of the fastest ways to navigate around Toad. It’s not only helpful for finding unknown options or undiscovered areas of the product. Want to get somewhere fast? Let’s try it opening the Editor. Let’s use the keyboard shortcut Ctrl + J and type e into the Jump to… box. Below are some of the results that display. Let’s keyboard down to open an Editor instance. That was quite a few keyboard actions but if you try it again you’ll notice that the Editor has moved up to the top of the list. The search remembers what you commonly use and tries to give you more relevant results. As many of you are aware, Toad’s Editor has rather sizable number of buttons in the toolbar and you might not remember where a certain button is located or what it looks like. Double-click and its location is pinged on your open Editor. 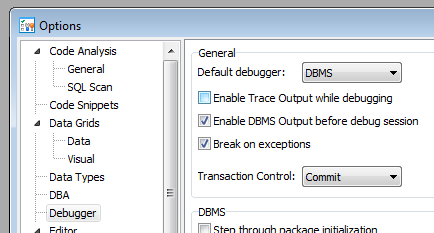 Let’s say I want to enable trace output while I’m debugging. Sometimes it’s a lot faster using the search than sifting through all the different pages in Options. Simply type trace output and you’ll get results that look pretty similar to these. Double-clicking or hitting Enter on the result will take you directly to the option and even ping the location in the window. 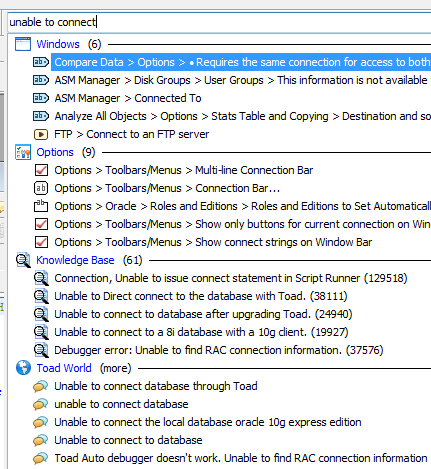 Jump Search can also take a look into your recent SQL statements without needing to first open the SQL Recall window. As you can see - I have two results for hiredate. Quest Software offers an extensive list of Knowledge Base articles that you can search using Jump Search. Also available are results from the community driven Toad World. Both provide excellent resources in the event that you hit a roadblock somewhere. There are a number of other great search features as well but this has been a quick introduction to search in Toad for Oracle. If you have any suggestions or questions let me know in the comments or on our forum.